We strive to provide exceptional patient experience and ensure safe outcomes through a respectful partnership between our patients and their caregivers. Our Patient Experience team, part of the UF Health Sebastian Ferrero Office of Clinical Quality and Patient Safety, coordinates and directs collaborative activities, initiatives and projects to improve the delivery of patient and family-centered care. The patient experience encompasses all interactions with your care team during your stay at UF Health. The care team includes physicians and nurses, as well as all hospital staff you and your family meet in our health system. Information Sharing and Involvement — To communicate and share complete and unbiased information with patients and their families, and ensure they receive timely and accurate details so they can take part in care and decision making. Dignity and Respect — To listen to and honor patient and family ideas and choices and to use patient and family knowledge, values, beliefs and cultural backgrounds to improve care planning and delivery. Collaboration —To invite patients and family members to work together with health care staff to develop and evaluate policies and programs. Information Sharing — To communicate and share complete and unbiased information with patients and families in useful ways. Patients and families receive timely, complete and accurate details so they can take part in care and decision making. Involvement —To encourage and support patients and families in care and decision making at the level they choose. Enhancing the Patient Experience is one of our Big Aims (see “Patient Safety”). The patient experience encompasses all patient interactions with your care team during a stay at UF Health Shands. The care team not only includes the physicians and nurses, but it also extends to all hospital staff you or your patient comes in contact with while being treated. The patient’s experience can be described as the story a patient or their family member would share about their care in our health system. The experience consists of the patient’s physical comfort, clinical care, education, emotional and spiritual needs in addition to the care their loved ones received. We encourage you and your family to partner with us in your care. We value your feedback because it allows us to continually improve and reassures our staff that their efforts are making a difference. We survey patients discharged from our hospitals and those who receive care at UF Health Physicians outpatient practices. If you receive one of our mailed surveys, please complete the survey and return it in the prepaid envelope. Please consider joining us as a Patient or Family Advisor. Participation gives you and/or your family member the opportunity to share your experiences with our health system and your views on how patient care and services can be improved at UF Health Shands Hospital. There are a variety of different voluntary opportunities available for those interested in becoming an Advisor. Patient and Family Advisors and staff work side-by-side to identify issues, brainstorm unique solutions and implement change. Patient advocates act as liaisons between our patients and their care team, and provide guidance about patient rights and responsibilities. Please speak with a nurse or nurse manager if you have concerns about the quality of care that you or a family member are receiving or have received at our hospital. If your concern involves a member of the medical team, please ask to speak with your attending physician. Please contact Patient Advocate Services at 352-265-0123 if you feel that your issue wasn’t resolved. You may call at any time during or after your stay. The office is staffed 8 a.m.-4:30 p.m., Monday-Friday. After-hours and on weekends, please ask your caregiver to contact the team coordinator for any immediate concerns that cannot be handled by staff on the unit. We provide interpretation services each year to thousands of patients and their families with limited English proficiency to ensure patient safety and compassionate care. Spanish medical interpreters are available 8 a.m.-4:30 p.m., Monday-Friday, to assist patients and families during their hospital stay. Interpreters are also available for some outpatient clinic and procedural appointments. We provide this service without cost to patients or their families. We also offer 24-7 phone interpretive services in nearly 200 languages. Video remote interpreting terminals are available for patients who are hearing impaired. Patients can use these VRI devices at the bedside to provide immediate access to sign language interpreters. We also partner with community-based sign language interpreting services, and provide assistive devices including telephone handset amplifiers and telephones compatible with hearing aids. Please contact the Office of Patient Experience for assistance at 352-353-5084. We believe our employees are our greatest asset because they are highly skilled, take pride in their work and offer a welcoming environment for our patients, families, visitors and customers. Please let us know how we’re doing. Next time you spot someone making an extra effort, remember you are the eyes and ears to help us ensure excellent behavior and/or performance is recognized! Please let a care provider know you would like to nominate an employee for a CSK award. 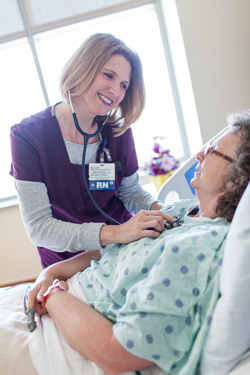 We continuously strive to deliver top-notch care and service to our patients. Our goal is to provide you and your family with the best customer service of any hospital. We are also dedicated to providing you and your family the best customer service of any academic health center in the country. If we fail to meet your service expectations please let us know. You can speak to a Nurse Manager, Nurse or Operations Director or leader of the area in which you are receiving care. If an issue cannot be resolved, please contact Patient Advocate Services at 352-265-0123. We believe the best time to fix a problem or resolve an issue is while you are in our care. Please let us know how we’re doing. Thank you.